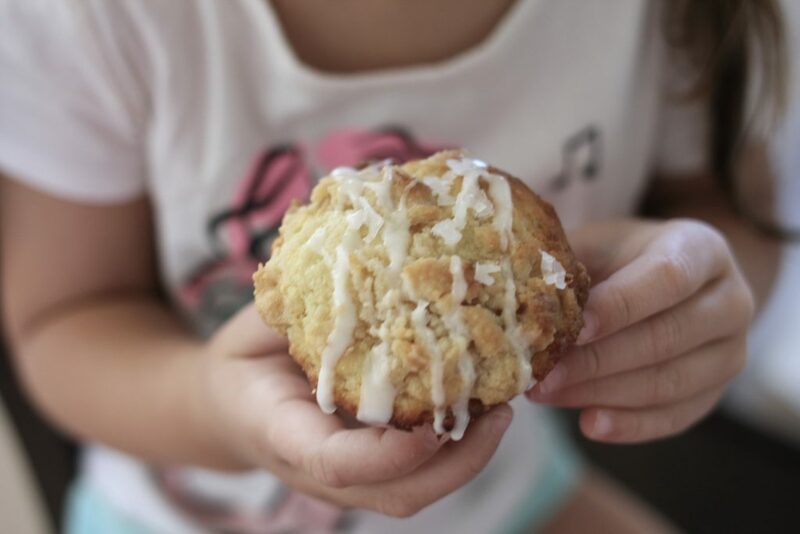 Who can resist a Fresh Peach and Coconut Muffin? 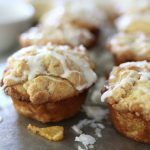 Peach and Coconut Muffins with Coconut Streusel Make some now while peaches are fresh and plentiful! It’s peach season. Oh, how I love peaches! The smell of fresh peaches ripened by the sun brings a smile to my face. I still remember summers when my mom and dad canned peaches…bottle after bottle of peaches stacked in the fruit room in the basement, stored away for the rainy Pacific Northwest winter months. For years, I did the same (not quite to the level of my parents) but on a much smaller scale. I bottled peaches until my floor was a sticky mess and I was forced to move on to other projects… My boys especially loved those peaches! They would ask for a bottle of fruit and then eat the whole jar in one sitting. This is Ani, my oldest grand baby, being my big helper! Now that all of my kids have all grown up, I buy a box of peaches and make jam and freeze several bags of sliced peaches and then make every dish I possibly can that includes peaches, until fruit flies start to invade my kitchen! 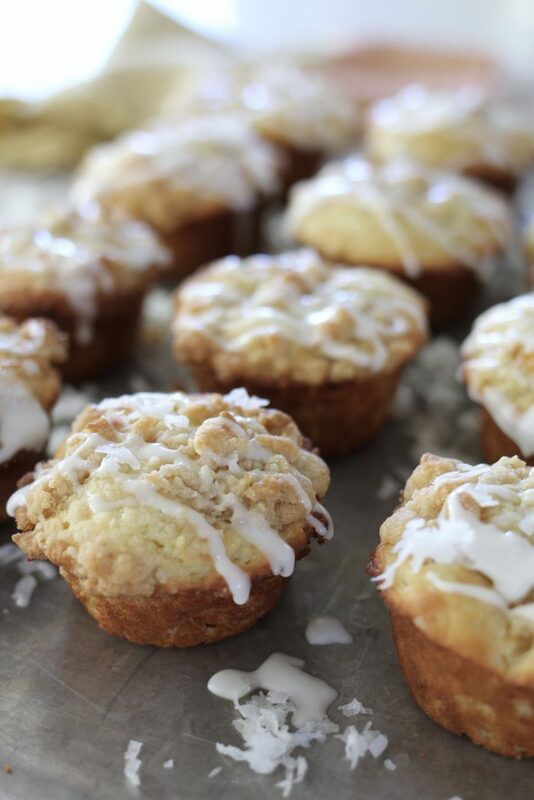 I love this recipe for Peach and Coconut Muffins with Coconut Streusel. It’s made with peach yogurt, coconut, buttermilk, peaches and topped with a coconut streusel and drizzled with a lemon cream glaze. 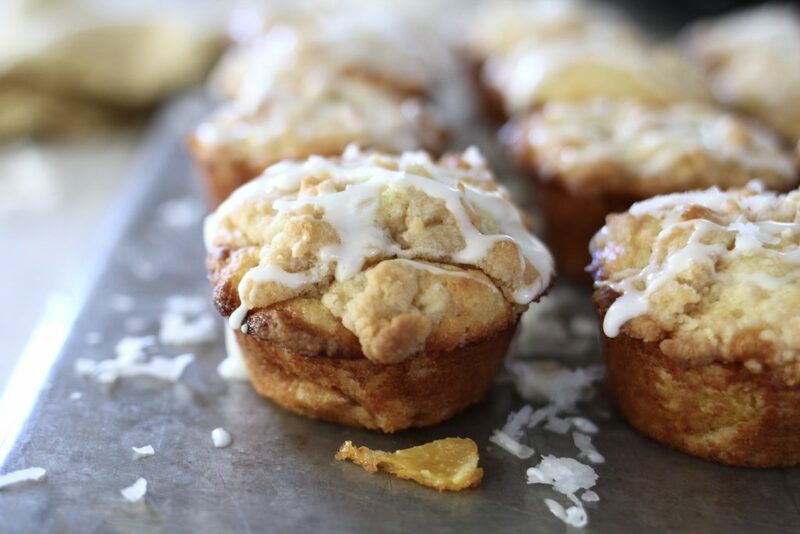 I know you’re going to love ABK’s Peach and Coconut Muffins with Coconut Streusel. They’re ideal for peach season, but can also be made with frozen, chopped peaches. 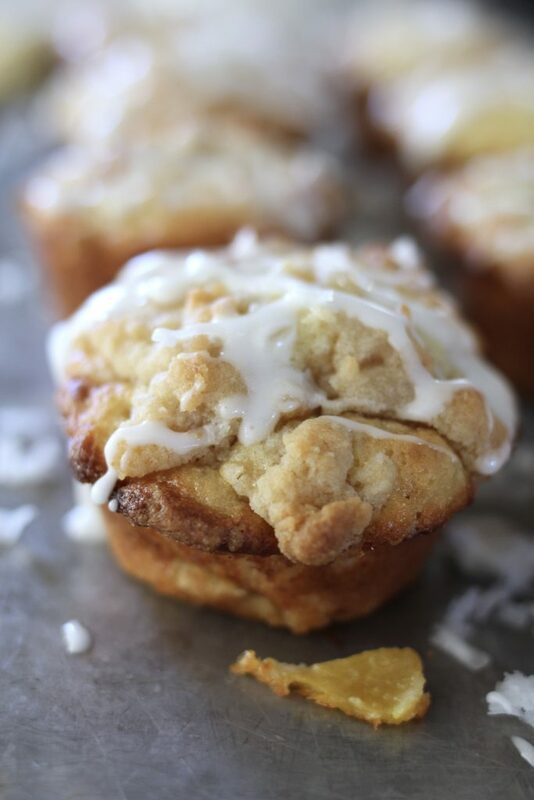 The muffins are so pretty they would be perfect served at a wedding or baby shower brunch with an overnight breakfast casserole, a fruit platter and a salad! Preheat oven to 400 degrees, place rack in center of oven. Generously grease a 12 cup muffin tin. Cream the sugar and butter in a large bowl ( I use a stand mixer). Add the yogurt, eggs and buttermilk, Beat on low until smooth. If using peach yogurt, chunks of peach will remain. Add the flour, baking powder, baking soda, salt and coconut to the batter and mix on low just until the dry ingredients are mixed in and the flour is no longer visible. Fold in the chopped peaches. 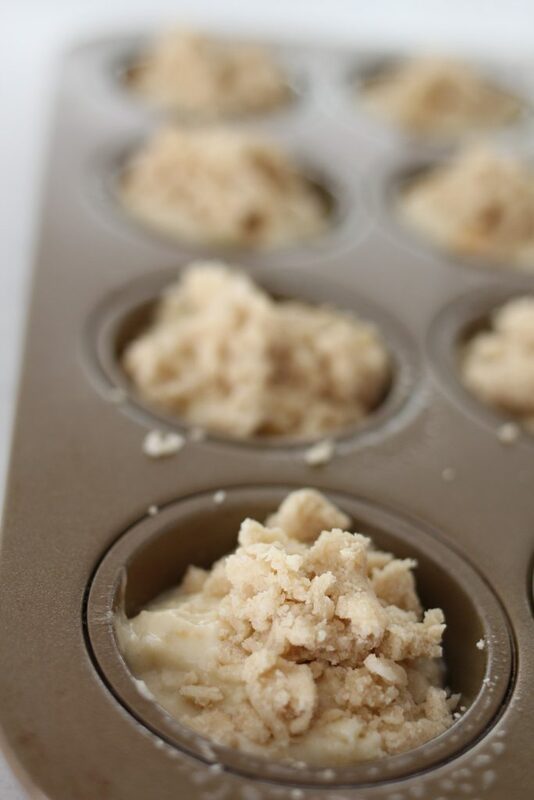 Using a scoop, place the batter into 12 muffin cups, the cups will be about 3/4 full. Rinse out the bowl, and mix the streusel ingredients together, using a large spatula or a fork. You may also use the paddle attachment on the stand mixer, mix on low. 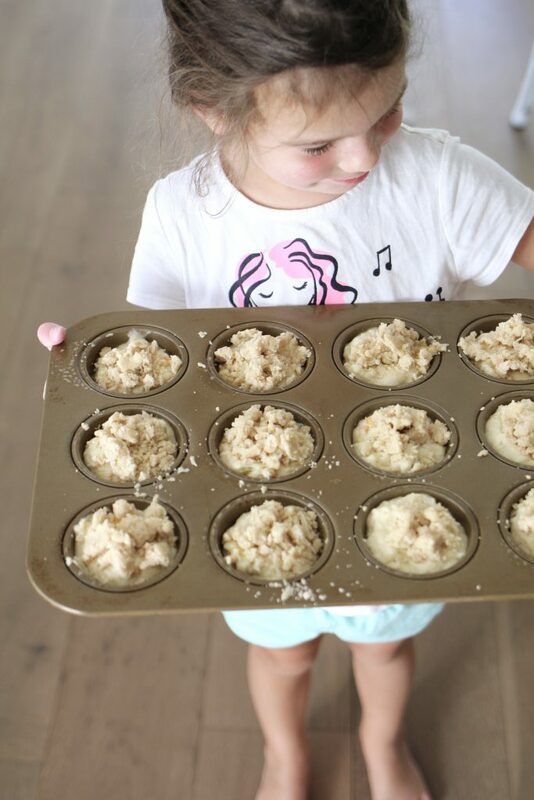 Crumble the streusel ingredients with your fingers and place a small amount on top of each muffin, distributing evenly over the 12 muffins. Place the muffins into the oven and bake for 18-22 minutes or until a toothpick inserted in the center of a muffin comes out clean. Meanwhile, rinse out bowl again and mix glaze together in same bowl. Whisk the powdered sugar, cream and lemon juice. Let sit until muffins have cooled. 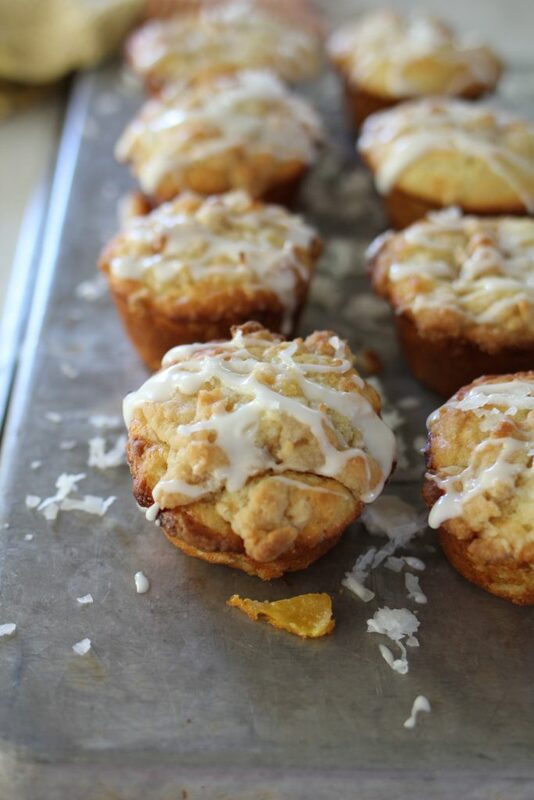 Drizzle glaze over the muffins with a spoon. -You may use milk in the place of buttermilk, the result will not be quite the same, but will work. If you have sour cream or 1/3 cup of yogurt, you may use that in place of buttermilk. -Fresh peaches vary in degree of juiciness. If your peaches are very juicy, place them in a bowl and mix with 2 teaspoons of sugar. Toss and let the peaches macerate for about 15 minutes. Drain the juice off of the fruit (discard juice) and use fruit in recipe. This process with extract some of the excess juice off of the fruit so the muffin will not become soggy! -Frozen peaches work well in this recipe. Do not thaw before using, just chop the frozen fruit. I have also used frozen pineapple (3/4 cup along with 3/4 cup of frozen peaches) with great results! I actually prefer 1/2 pineapple and 1/2 peaches. I have not tested canned peaches or canned pineapple or fresh pineapple in this recipe. 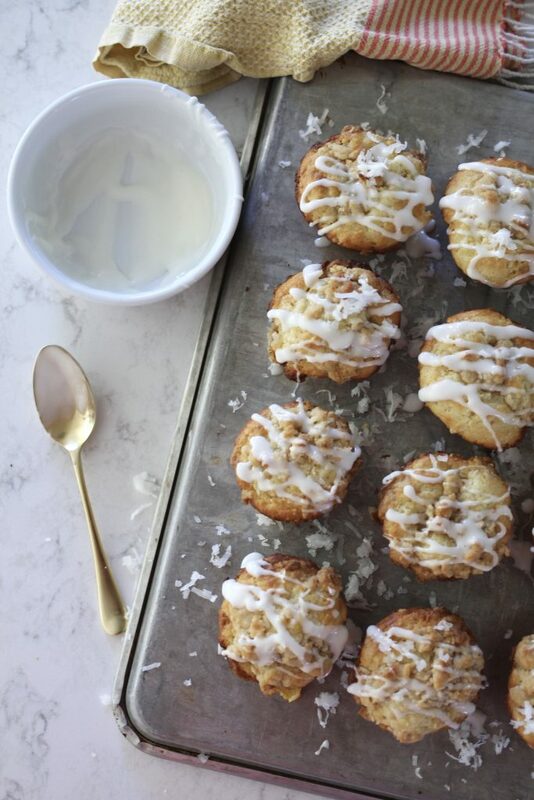 -Coconut oil may be used in place of the butter in the muffins, but not in the streusel. I like the flavor of coconut oil in muffins, but the structure of the muffin will be less stable than if using butter. These were absolutely delicious. I huge hit in my house (and some of my neigbor’s houses too!). Thanks! These were absolutely amazing! My whole family gobbled them up and insisted i make a second batch for breakfast the next morning! 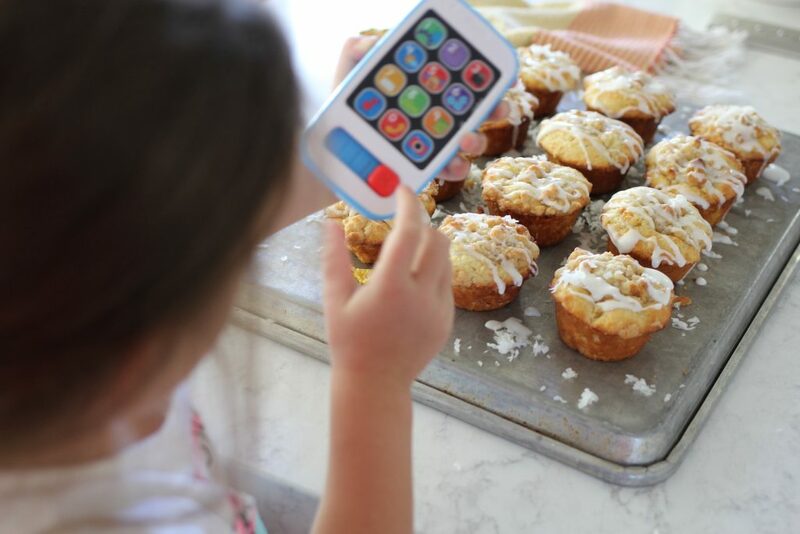 Im glad your family loved the muffins! Thanks for reading ABK! ???? I made these more than once with fresh peaches from my tree…they were Uh-MAZ-ING!! Seriously. I LOOOOVE peaches and this just shot to the top of my peach recipe list…and I have a LARGE list. Thanks!!! Thanks Tara! I love this recipe too! You are lucky to have your own peach tree. Thanks for reading ABK! 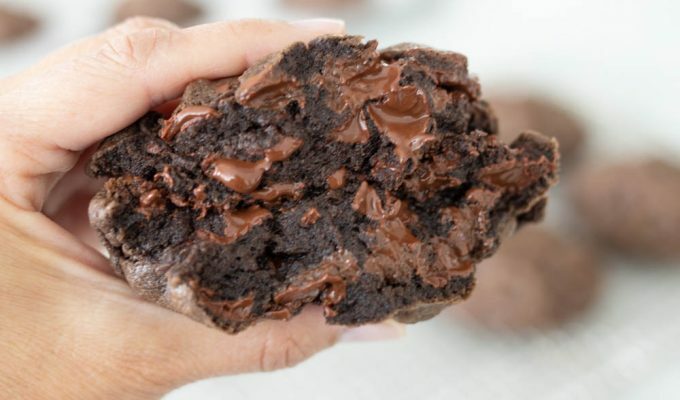 I want to make these the night before a breakfast but feel like they would be better served warm. Have you had them room temp? Is there a way to warm them up in the morning? Thanks! They are really delicious served warm, but are equally good at room temperature. They need to cool enough so when the glaze is applied it doesn’t melt into the muffin. You can make them the night before and then just heat them up at 325 for about 5-8 minutes. Glaze after heating up. Made these today for a gathering. They were delicious and a huge hit. I didn’t have any yogurt so I used sour cream. Great use of my many fresh peaches! Yum! Im sure the sour cream made these over the top delicious! How come your recipes that I make never look like yours?! They were really good though! I’m so glad they taste great! Thanks for your kind words. For the streusel and when you say 1/4 cup coconut does that mean coconut flakes? Yes, shredded coconut. Hope you love this recipe! Made these today all dairy free (for our youngests allergy) and they were de-lish!! Loving yr recipes! I also made the levain cookies dairy free and they turned out great!! You are my new recipe source for all things yummy!